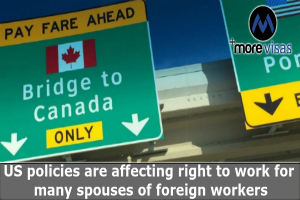 Canada is offering an open work permit to all spouses who accompany accomplished temporary workers. The spouses of Indians who accompany skilled professionals on the US H-1B visas are preparing for tough days. In addition, there is a possibility that they will not have the ability to work from June onwards. The Department of Homeland Security may withdraw the rule which began in 2015. It gave the right to spouses of selected persons on H-1B visas to work in H-4 visa. Before this change, the spouses of H-1B visa holders were not permitted to work in the USA. As a result, this created a condition, where the H-1B visa holder, became the only breadwinners for their family. When the Employment Authorization Document was introduced there was a change. This was a welcome relief for the families. Even the spouses were permitted to work. Furthermore, most of them had good skills and rich work experience. Consequently, close to 100,000 H-4 visa holders took benefit of the EAD and returned to work. Now the spouses of H-1B visa holders who gave an application to get permanent residency, are anxious about the decision. However, this independence was only for a short time. There were new policies which were introduced by President Trump. He had gained power on the promise of a strict immigration policy. Moreover, he had the aim to protect local workers and industry and avoid foreign competition. Moreover, The DHS has explained that this measure, to withdraw the right to work, under an H-4 visa, is in support to bring policies and practices in alignment with the Executive Order of President Trump. At present, he is pursuing the concept of Buying American products and Hiring American workers. The withdrawal of H-4 EDA has created an uncertainty among overseas professionals working in the United States. This was the result of the policies of President Trump. As a result, the skilled workers in the Information Technology sector prefer to migrate to Canada. These professionals who suffer from American policies command a great value in Canada. They are pursued by the governments in the provinces. Moreover, the federal government is also showing an interest in them. There are many immigration policies and programs specially made for them. This is ideal for allowing their entry in Canada along with their spouses. There is a Global Skills Strategy of Canada, which also has a Global Talent Stream. It has started from June 2017 and has reduced the processing time of applications which allows the temporary work permit to specifically skilled workers within two weeks. Their Spouses can open a work permit, which is not specific to any job. The dependents have a right to pursue studies in Canada. The workers in the International Mobility Program, as well as the Temporary Foreign Worker Program, will benefit from it. A recent report of Tech Sector Hub of Toronto, mentions that Global Talent Stream is of great help. It is a major force in the increase in international hiring of the Toronto tech companies. There are many applications from US workers, and the reason behind this is the present US political climate. Applicants to Canada have many options to gain permanent residence status. It is renewable after five years and permits the professionals to reside and work in any place in the country. In the Express Entry system, the candidates can enter by using these three classes. They are the Federal Skilled Worker Class, the Canadian Experience Class, and the Federal Skilled Trades Class. The qualified H-1B applicants, who are proficient in English, besides having rich work experience, have an advantage in it. It gives a rank to the candidates based on the human capital factors. It gives marks on proficiency in the language, education, and age, and also the work experience. Applicants also get points for the credentials of their spouse. Additionally, Indians have been successful in many immigration programs of Canada. They are on the top of the list of professionals, who get an invitation to apply, using the Express Entry system, and the PNP of Ontario. PNPs are a very popular option to attain permanent residence. The programs meet the local labor of provinces and territories. They nominate overseas workers to get permanent residence. Many provinces manage PNP streams, which are in alignment with the Express Entry system. They give the provincial nomination to Express Entry candidates. Additionally, they also get 600 points in the CRS. Firstly, the candidates can enter Canada using the temporary work permit. Around 300,000 foreign workers use it annually. There are many work permit options for them in the Temporary Foreign Worker Program and the International Mobility Program.